7 AMB., 5 DORM. - 433 M2. PARQUE LURO. 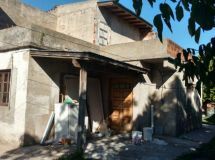 SOBRE LOTE DE 10 X 43,3: CASA DE 4 AMBIENTES AL FRENTE A DEMOLER O RECICLAR + DUPLEX DE 3 AMBIENTES TAMBIÉN A RECICLAR. CUENTA CON TODOS LOS SERVICIOS. LISTO PARA ESCRITURAR.